KENNEDY SPACE CENTER, FL--A hydrogen fuel valve in one the shuttle Atlantis' three main engines that appeared to leak during an external tank fueling test Wednesday will be replaced next week in parallel with work to X-ray structural stiffeners in the tank's central compartment, officials said Thursday. The valve replacement work is not expected to impact Atlantis' July 8 target launch date. Engineers at launch complex 39A drained the huge external tank overnight Wednesday, clearing the way for installation of an Italian-built cargo module into the pad gantry's payload handling room Friday. If all goes well, the protective gantry will be rolled back in place around the shuttle Saturday, the ship's cargo bay doors will be opened Saturday night and the cargo module will be installed in Atlantis' payload bay Monday. While the payload transfer work is underway, engineers plan to begin X-ray inspections Saturday to verify the performance of so-called radius block doublers that were installed over the tops of vertical rib-like stringers that form the backbone of the external tank's central "intertank" compartment. The ribbed intertank separates the upper liquid oxygen tank from the larger liquid hydrogen tank below. 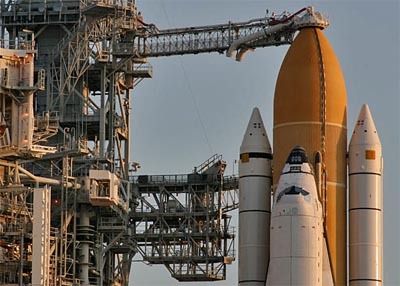 Work to beef up Atlantis' tank, ET-138, was ordered in the wake of stringer cracks that developed in a tank used for the shuttle Discovery's final mission. After an exhaustive analysis, engineers concluded the lightweight aluminum-lithium alloy used in the stringers was from a lot that was more brittle than usual. When supercold liquid oxygen was loaded, the bottom of the "LOX" tank contracted, pulling the tops of the intertank stringers inward. The tank was designed with that contraction in mind, but the more brittle alloy used in Discovery's tank resulted in several stress relief fractures. That raised concerns about the tank's structural integrity and the possibility of cracks developing in flight that might cause foam insulation to break away. NASA managers ultimately ordered doublers installed over the top few inches of 105 of the 108 stringers used in the intertank section of Discovery's tank to make them less susceptible to stress-relief cracks. Because the stringers in Atlantis' external tank were made from the same lot of suspect alloy, engineers earlier this year installed radius block doublers around the circumference of ET-138's intertank. The tank was loaded with a half-million gallons of liquid oxygen and hydrogen rocket fuel Wednesday to subject the components to cryogenic temperatures. Starting Saturday, engineers will carry out X-ray inspections of the tops of the stringers on the side of the tank facing Atlantis to make sure no cracks developed when the tank was loaded with frigid rocket fuel. None are expected, but the work will take several days to complete. Working in parallel, engineers plan to remove the main fuel valve on main engine No. 3, which showed signs of a downstream temperature drop indicative of a small leak during the fueling test Wednesday. The main fuel valve, located downstream of the engine's high-pressure fuel turbopump, is used to route hydrogen to the main combustion chamber walls for cooling, to help drive a low-pressure turbopump, to help pressurize the external tank and to cool the engine nozzle before before. The fuel flow is recombined as part of the combustion process. If no problems develop, engineers expect to replace and retest the valve with no impact to Atlantis' planned July 8 launch target.